I boarded an Aeroflot flight from Kiev to Moscow and quickly went to my seat. After the austerity of flying hundreds of times with Aeroflot throughout Russia, I had finally been upgraded to business class. I assumed that my servant, Uttama-sloka dasa, who had been on many of those difficult flights with me, had also been upgraded. "Sit here, Uttama-sloka," I said as I settled in, "here, on my left." Uttama-sloka looked a little surprised as he sat down next to me. Passengers continued to fill the plane when suddenly a well-dressed gentleman came before Uttama-sloka. "Excuse me," he said, "you're in my seat." "How is that possible?" I whispered to Uttama-sloka. "We're together in business class." "Actually, I'm in economy," said Uttama-sloka, "but let me see what I can do. I know you'd prefer that I sit with you." Uttama-sloka turned to the gentleman. "Sir," he said, "would you mind changing seats with me? This is my spiritual master, and I'd like to accompany him on the flight." The gentleman looked around the business-class section. "Which seat do you have?" he said. "I'm in economy," said Uttama-sloka, "but it's a window seat." The gentleman looked at him and then at me. He stood there for a moment. "Well, all right," he said finally. "Give me your boarding pass." Uttama-sloka handed him the card and he slowly made his way back to the stuffy economy section. "That was amazing," I said. "Yeah," said Uttama-sloka. "I wasn't sure he would do it. It's a three-hour flight, and there's a world of difference between economy and business class." "Yeah," I said sarcastically, "tell me about it." I thought about the flights I'd taken on Aeroflot's infamous TU-154s. "It was very courteous of him," said Uttama-sloka. "Ajnata-sukriti," I said. "Unknowing devotional service. The Lord will reciprocate." Throughout the flight Uttama-sloka and I were offered the usual business-class perks: a warm cloth to wash our hands, some juice, some nuts. At one point, Uttama-sloka asked the stewardess if she could offer some of the same service to the man who had exchanged seats with him. "At least could you give him some juice?" he said. "I'm sorry," the stewardess said. "He's in economy. If he wants juice he'll have to pay." I would have been happy to buy the gentleman a glass of juice, but neither Uttama-sloka nor I had any cash. I was traveling with just my credit card. Exhausted from an intense travel schedule, I soon fell asleep and awoke just as we were landing in Moscow, where I went through the hassle of another Russian Immigration routine. "They always ask me so many questions," I said to Uttama-sloka afterwards. Uttama-sloka laughed. "You've been coming every year since 1988," he said. "No tourist or businessman has ever done that. They're keeping an eye on you." As we approached Customs I noticed a group of officials surrounding the gentleman who'd given Uttama-sloka his seat. They were going through his belongings and seemed to be interrogating him. He was obviously in distress, and even from a distance I could see he was sweating. There were several lines for Customs, and Uttama-sloka and I ended up in the line next to the gentleman. By now the officials were talking among themselves, and as we passed by the gentleman he turned to Uttama-sloka. "Help me," he said in a hushed voice. He sounded desperate. "What's the problem?" whispered Uttama-sloka, looking around to make sure he wasn't being watched. "I've brought more money into the country than is allowed," the man said. "They want to arrest me and confiscate the money." "Wow!" said Uttama-sloka. "That's serious." The man looked nervously at the officials still absorbed in their discussion and then back at Uttama-sloka and me. "There is only one way I can get out of this," he said, "and that's if I split the money with the two of you." "Is that legal?" said Uttama sloka. "Yes, it is," the man said. "Anyone is allowed to bring in ten thousand dollars or less without making a declaration." "How much do you have?" said Uttama-sloka. "Thirty thousand," said the man softly. After a short pause he went on. "They'll put me away for a long time," he said. "Please help. There is absolutely no risk on your part." Uttama-sloka looked at me for an answer. I knew about the ten thousand dollar limit. It's posted in all the international airports in the country, so there was no apparent risk. I also thought about how the gentleman had put himself out for us. I nodded. "OK," I said. "Go for it." Uttama-sloka took a deep breath. "Excuse me officers!" he called out, "But this gentleman is carrying money for me and my friend here. It's not all his." The officials stopped talking and looked at Uttama-sloka and me. "Since when have you come into the equation?" said an officer. "This man never mentioned you." "He was nervous," said Uttama-sloka. "He got overwhelmed. It happens." The officials walked over to us. "If the money belongs to all of you," said one, "then explain why he's carrying all of it." "No particular reason," said Uttama-sloka. "He just ended up with it." It wasn't the best answer, but it worked. "OK," said an official as he handed the money back to the man. "Divide it up now and leave the airport immediately." The gentleman quickly counted the cash, divided it into three, and gave me and Uttama-sloka big wads of hundred dollar bills. Outside the terminal the three of us gathered in a quiet area, and Uttama-sloka and I handed the gentleman his money. The gentleman heaved a sigh of relief. "That was close," he said. "It certainly was," said Uttama-sloka. "I'm grateful," the gentleman said. "Thank you." I smiled. "We owed you a favor," I said. The man laughed. "Actually," he said, "I gave up my seat because your friend told me you are a spiritual master. Believe it or not, I practice yoga and I like to read Eastern philosophy." "That's very interesting," I said. "And what is your profession?" "There are some things we can't discuss," he said quietly. As he secured the money in his attaché case he looked up. Thank you again," he said. "I won't forget how the Hare Krishnas helped me." We watched as he got into a large black limousine and sped away. Uttama-sloka turned to me. "Looks like he was a pretty important guy," he said, "and he appreciated how we helped him with that money." I smiled. "Yes," I said, "but he doesn't understand the real benefit he has achieved." "By giving up his seat," I said, "he performed devotional service. That little service will reap a far greater reward than all his money. It guarantees he'll get another chance for devotional service in the future, that he'll take a human birth again." "'In this endeavor there is no loss or diminution, and a little advancement on this path can protect one from the most dangerous type of fear." "Yes," said Uttama-sloka. "And maybe that chance for more service will come in this lifetime because he mentioned he wouldn't forget how we helped him." "Very likely," I said. 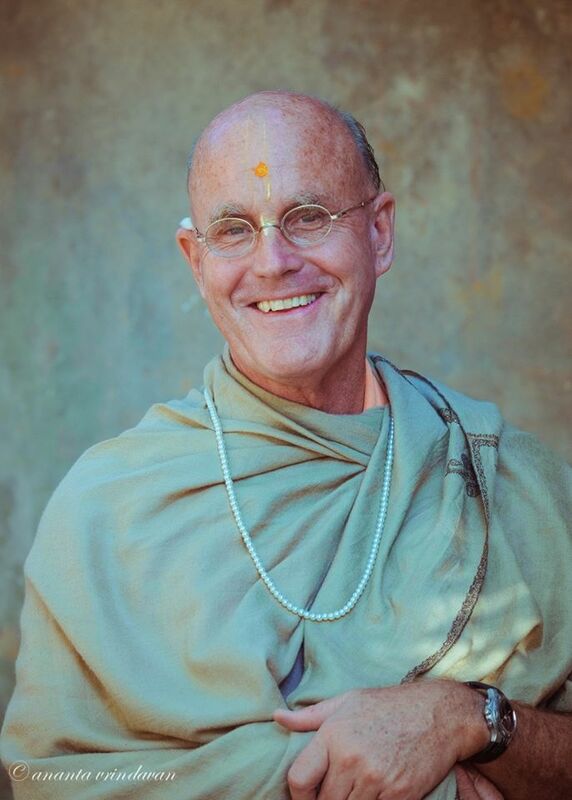 "Maybe one day some devotees will be surprised when he uses his influence to get them out of a difficult situation or unknowingly helps them or gives a donation. The Lord works in mysterious ways." We walked a little further and met some devotees who were waiting for us. "Here is an example of giving service to the Supreme Personality of Godhead even without knowledge. Such service is called ajnata-sukriti. King Satyavrata wanted to show his own mercy, not knowing that the fish was Lord Visnu. By such unknowing devotional service, one is favored by the Supreme Personality of Godhead. Service rendered to the Supreme Lord, knowingly or unknowingly, never goes in vain."